Over the years, technology has evolved hugely and to a great extent, the credit has to go to all the innovations taking place one after the other. Each innovation has turned out to be a building block for a business and as a fine result of this; it has become simpler for the enterprise to conduct business giving less chance for complications. One thing that might give a hard time for the business is the security, but at the same time, has worthwhile and simple solutions for tackling it. One fact that makes a business feel insecure is letting in the wrong persons into the premises, although there are certain other security related setbacks a business has to constantly keep an eye on. As a business is a pack of valuable assets, it is necessary to safeguard those assets. Allowing access to an unauthentic source into the premises is giving access to all your business data, passcodes etc. A Biometric System Installation will allow only authorized persons into the premises through card swiping or the fingerprint scanning system. A bio-metric system is a way through which a person is identified with the help of a person’s unique characteristics like fingerprints, iris of the eye, face recognition etc. These physical characteristics are one’s own and are unmatchable with any other person. 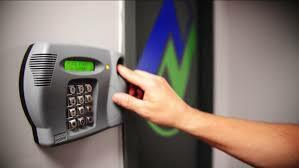 The biometric system also uses other modes of identification like cards, passwords to grant access. The access to the unauthorized persons can be strictly restricted through the biometric systems. Apart from allowing or denying access, a biometric system assists in tracking attendance and a lot more. VRS Technologies is stocked with biometric systems for any kind of business, setting in front of you a variety of options to suit your budget. Our biometric systems can track attendance, store logs for generating daily reports and making the payroll and a lot more. We provide constant support right from installation to the performance of the biometric system. We have our engineers by your side to interact with you anytime in case there is a query. You are free to contact VRS Technologies at +971-55-5182748 for securing your premises with our biometric systems to enable your business security. You can visit our website www.vrscompouters.com to learn more about us.